We provide self-help, private ticket, and community based support to ensure your Community runs as well as it can. If you ever have any issues that you cannot solve with the methods below, please ask. We are here to help! The first step to obtaining support should always be from your AdminCP. If you log into your AdminCP and visit the Support location, this will take you to our self diagnosing support area. There are 3 areas of note on this page, which can help you in diagnosing, and ultimately resolving issues that you may encounter on your system. 1. System Check - This will give a quick overview of the system requirements and whether or not they have been met, along with any recommendations. This can be helpful if you have changed hosts, as it may be that your server needs additional components which have been overlooked. 2. Support tools - Depending on which option you choose, you can find information from our guides directly from here, or tell the system that something is not working correctly. When choosing the latter option, the system will try to determine what the issue is, and give you hints on how you may be able to resolve the problem. These can be helpful if you have an error which you are unsure on how to resolve, and is discussed further below. 3. 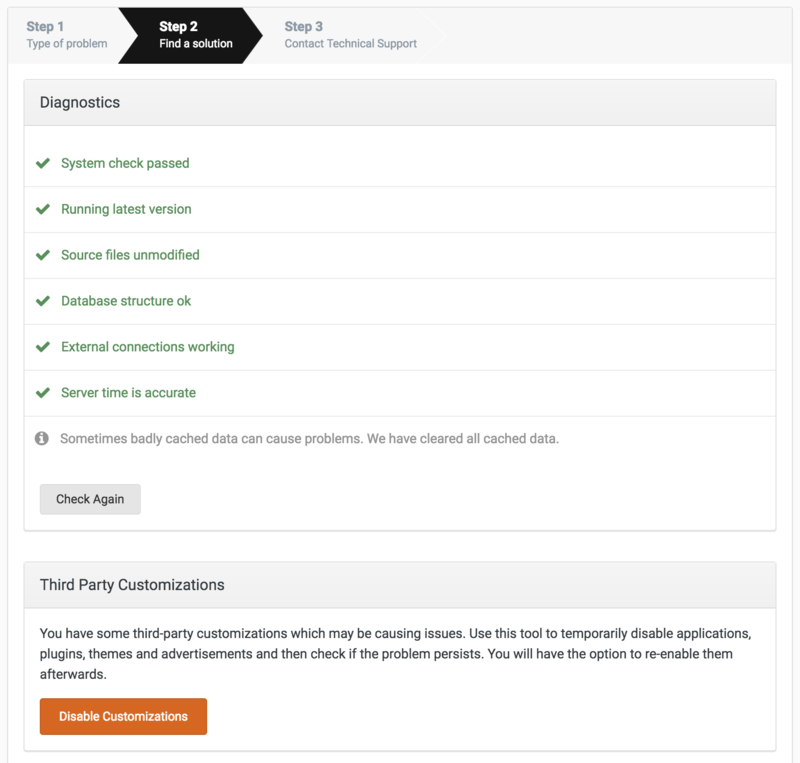 Diagnostic logs - There are 2 types of logs here. Error, and system. Error logs are items which are expected, but still shown to the user. An example of this may be a permission error, or notice that an item is unavailable. You will find extra settings in this area also, to choose how robustly you would like to log these types of errors. System Logs are those in which would not happen in normal use. So for example if you had a database connection issue, an unexpected coding issue, or anything else which is outside the normal parameters of the softwares intentions. Both of the above, can be helpful when members report that there has been an issue somewhere, and gives you little information. You can view these to see what error they experienced. The support tools section mentioned above is what you will generally use to try and overcome problems on your system. This is a set of diagnostic tools, procedures, and advise from the system to help you to resolve the problem yourself. Selecting "Something isn't working correctly." When selecting "Something isn't working correctly" it will do various things such as clear caches on the system, scan for incorrect files, and more. Once this has run and you see the screen above, you should always open another tab to see if the issue you were experiencing has been resolved. Also, the system may flag areas of concern and prompt you to resolve them. An important part of this is the "Disable Customisations" section. The majority of issues you will see in Invision Community are caused by customizations (themes, plugins, apps) that are not part of our default set. You should disable all customisations using the button provided and check on a new tab in your browser to see if this issue is resolved. If it has, then you know it is a 3rd party issue, and you should enable items one at a time until you find the cause. Once the cause is found, this should be reported to the developer of that 3rd party item. 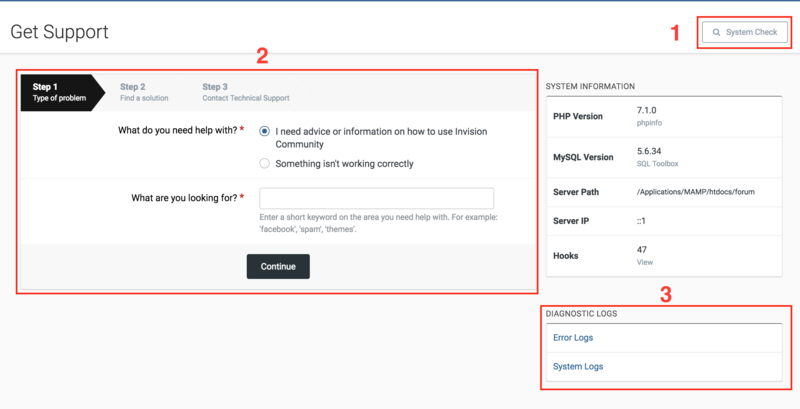 If you cannot find the issue using the built in tools, there is then an option to submit a ticket to our support team who will be happy to assist you in getting to the bottom of your problem. Provide a much information about the issue as possible. Including how to replicate the problem, and examples if possible. Often we will need access to your system to diagnose the cause of an issue. In this case, we will need some login details, and may at times require file system access. You can provide these securely from within your client area. To do this, log into your client area, select your license, then select "Review my details" (See further info below). Ensuring these are up to date, can often speed up the time taken to resolve your issue. Anything you have already attempted to resolve the issue yourself is worth noting within the ticket. 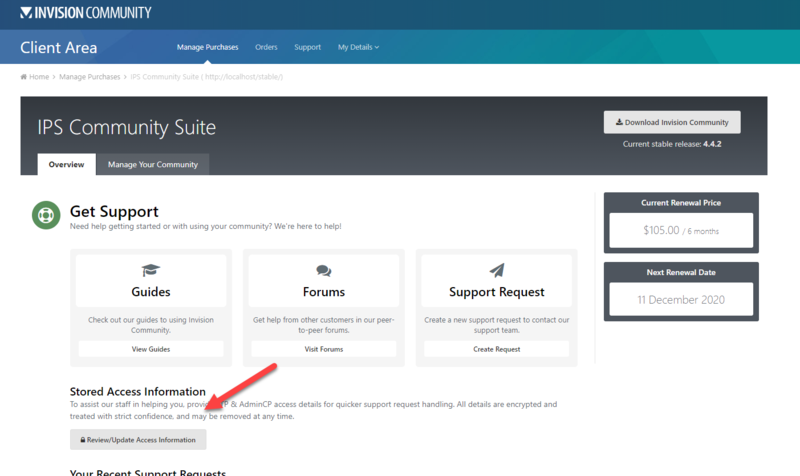 If you are not able to access your AdminCP or have a non-technical question, you can always submit a ticket directly in the client area as well. 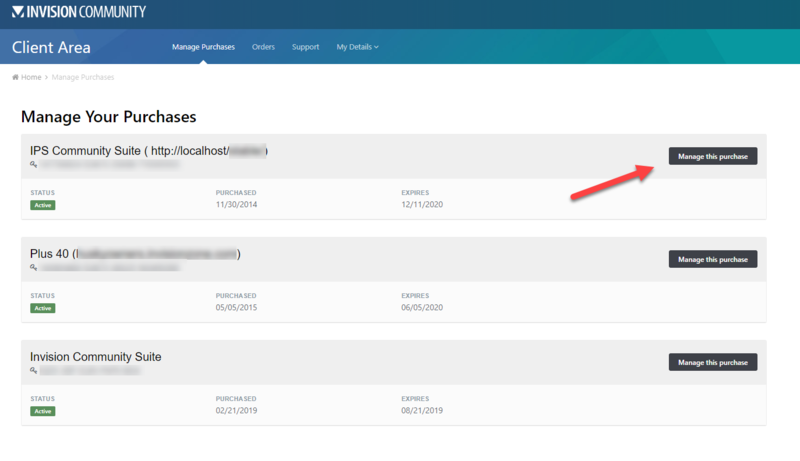 Once you have logged in, select "Manage this purchase" next to the license you are reporting an issue for. On the next page, select "Review/Update Access information"
You will then be presented with a form where you can securely add access information for your site. It is worth mentioning here that all IPS employees and contractors have executed elaborate non-disclosure agreements that protects the integrity of your data. Adding your information in this areas, ensures that it is stored in a secure location. FTP Access - If you are unsure on what FTP access is, you would need to obtain this from your hosting company. Admin CP URL - Your admin area by default would be at (for example) www.yoursite.com/admin/ . If you have not moved from this location, then you can leave this section blank. If however you have moved your admin location, then please populate the new URL here. 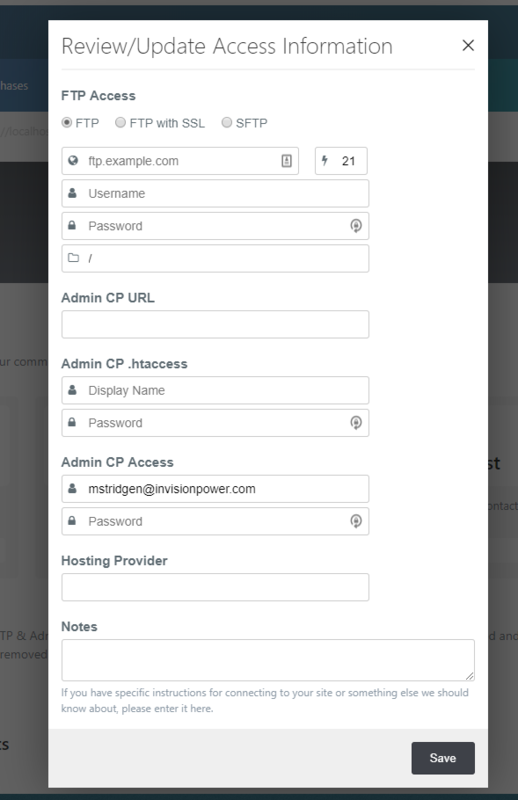 Admin CP .htaccess - If you have an additional username and password you enter prior to getting to the admin CP login page, then these details would be added here. If you do not, then its likely you do not have these, and you can leave the section blank. Admin CP Access - This is your admin username and password (or one that you create for our use). This must have full admin access in most cases, in order for us to assist. Hosting provider - The name of the company in which provides the hosting for your site. Notes - If there is any further information we need in order to be able to access your site, please ensure you add this information here. If you cannot get to the AdminCP at all, you can access the system logs from within uploads/logs on your file system. It is always worth checking these. It may be for example that your MySQL instance has crashed or some other item in which you know how to resolve. After this is complete, you will be shown a list of all items which have been disabled, and you will be informed to remove the line from your constants file. It is important that you do this, as you will not be able to navigate to any area of the admin CP until you have done so. You will then be able to enable items one at a time until the system breaks, in order to determine which of these items is causing your system not to function.